At All Phase Restoration in Denver, we believe that any belongings you can quick dry in 48 hours or less have a much higher potential for being saved than other belongings that take more than 48 hours. In this post, we will share seven ways you can attempt to quick dry the water damage space and your belongings in an effort to save them. Open the windows. Get a draft blowing through the room. See if you can get some of the moisture to ride the breeze from inside your home to the great outdoors. If a breeze is not available to dry out the space, set up a fan or two and direct it toward an open window or door. This will push any moisture away from the space. A dehumidifier will dry out the space and your belongings rather quickly. It will affect the moisture in the area directly, and it will help make an attempt at saving your belongings. In most cases, you will want to call a professional water restoration company in Denver to pump water out of your home. Nonetheless, there are some situations where you can pump the water out of your home. The less water in the space, the quicker it will dry. Whether you pumped a majority of the water from the space, or you simply need to clean up some remaining water, a wet/dry shop vacuum will help with the process. Again, remove as much of the water as possible to help it dry faster. You will want to remove all water damaged items and belongings from the space. This also helps remove moisture so that the space can dry faster. What’s tough is determine if specific belongings are able to be saved or if they need to be thrown away. The ultimate goal of water damage clean up is to remove as much moisture as possible from the space or area. This means you want to absorb moisture and remove it. Struggling to restore your home after water damage? 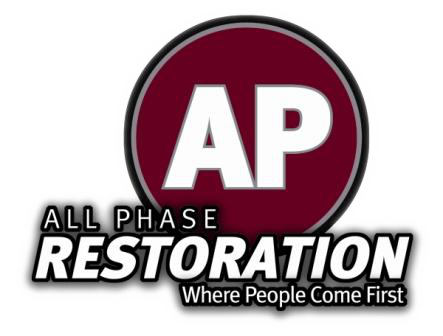 Give All Phase Restoration in Denver a call today!